Bobbie has been diagnosed today with Thoracic Outlet on both sides now and collapsing shoulders. Dr. Avery’s surgery only made everything worse, Bobbie says. Her feet are now red, inflamed and hurt when bumped even lightly in the mornings and at other times. She has lost strength in both arms and legs, and can no longer kick or move herself through the water at her rehab pool. She often wakes up and jumps out of bed screaming due to an intense cramps in her calves or parts of her feet. She has been through months of severe vertigo. Her shoulder blade still hangs loosely down her back and must be taped stable for Bobbie to function minimally during the day. Sometimes the other shoulder blade now must be taped too. In the mornings her arms and shoulder blades are often dead and useless for hours, and she simply must wait for some strength to come back in them. 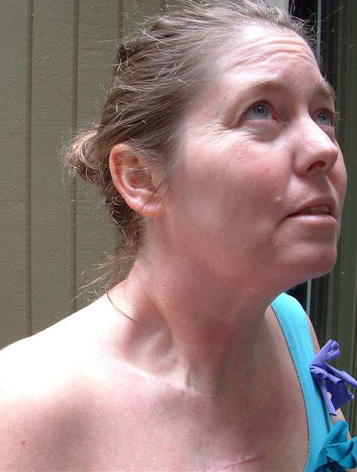 Bobbie lives in chronic pain with severe tightness in her neck and throat. She aspirates frequently. She has severe sleep apnea and acid reflux now. Her hanging right shoulder complex pulls down hard on the all the scar adhesions that have formed next to her throat and on her spine. Her spine has become a lot worse and Bobbie feels the disc herniation, which Kaiser failed to consider as a factor in her disability, has gotten a lot worse functionally. Almost three years after surgery now, a CT scan shows her cervical spine is now bending to the left, something a doctor told her is due to the missing muscle on the right. Bobbie is also concerned about potential heart and circulation problems now because she is basically living with half a neck that is tethered tightly in scar adhesions. She is nauseated every day now, though she has not changed any of her medications. She went through unexplained profuse sweating episodes which were unlike typical hot flashes one might have during menopause, and her C Reactive Protein registered HIGH when recently tested. Bobbie also often has difficulty getting a deep breath. She finds herself waking from sleep barely breathing and unable to get enough air. Overall, Bobbie fears she has lost so many muscles which help to hold up the head, shoulders and spine that she will either die from a stroke, heart attack, or broken neck. She fears becoming so disabled soon that she won’t be able to care for herself at all, and may need twenty-four hour care. She feels that due to the internal surgical excisions and tissue damage created by Dr. Avery cutting out so much of her neck and rib, Bobbie is at risk of becoming paralyzed completely. She cannot be bumped and can only be touched very lightly. Sometimes even the waves at the local pool where she tries to rehabilitate cause her so much instability that she must get out immediately. She says in order to get to any medical facility out of Santa Rosa, she would need to travel by ambulance because her neck and spine can’t tolerate being jostled for any distance as a passenger in any vehicle. Neck braces do not help with this. Photo taken 2007. Shows missing neck muscles and dropped collarbone; neck deformity.